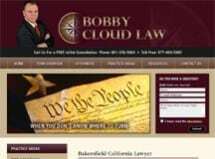 Bobby Cloud Law is a Bakersfield, California, law firm that concentrates on criminal law and family law for clients throughout Bakersfield and Kern County, California. As attorneys with extensive experience defending those accused of crimes, we understand that there is often more overlap between criminal law and family law than people think. When you are dealing with serious legal issues, an attorney who has a foot in both the criminal law and family law legal areas may be critical to the outcome of your case. At the law firm of Bobby Cloud Law, our attorneys take great pride in providing highly attentive, personalized client service. This means that we will communicate with you regularly, return all phone calls promptly and make your case our priority. Our goal is to effectively represent you and fulfill your needs at every stage of your case. When you work with a lawyer at our law firm, we will explain your rights and options and help you maintain realistic expectations throughout the legal process. Our clients appreciate our truthfulness about their situations, and our willingness to protect their rights when they are at some of the most vulnerable times in their lives. To learn more about how we can assist you in resolving a divorce, another family law concern or a criminal law matter, please call Bobby Cloud Law in Bakersfield, California, to schedule a free initial consultation with a caring, skilled lawyer: 661-323-2800.